Tour departures are at 5pm or 6:30pm. This service is available from March to November. We are comparing Paris Night Bicycle Tour & River Cruise Prices from leading ticket suppliers and Try to find you Cheap tickets prices on the market. The Night Bicycle Tour & River Cruise is the package that allows you to take an evening guided tour along the streets of Paris by bike and join a cruise of the Seine River afterward. As you reach important points of interest, the guide will allow brief stops to introduce the related attractions. The tour gets you between top tourist attractions in the centre of Paris and along the River Seine. Besides the Left and the Right bank of the river, the tour takes you to Ile de la Cite and Ile Saint Louis, two islands of Paris in the downtown area. Once the guided bike tour ends, you will join the river cruise the Seine. 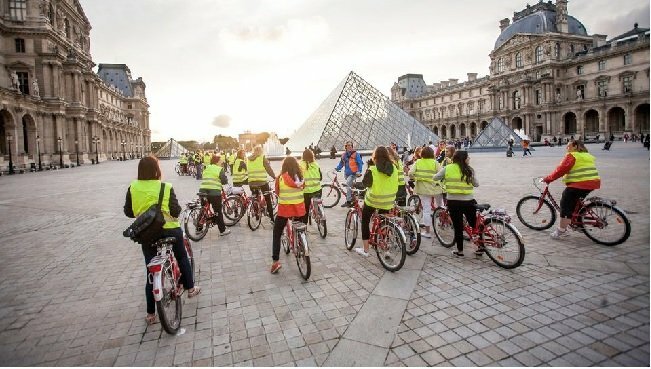 The bike tour offers a personalized experience in a small group and highlights the beauty of Paris during the evening. The river cruise introduces "the City of Lights," during the night. The combination of the guided tour by bike and the river cruise is ideal for all people wishing to acquaint themselves with Paris efficiently. The tour is suitable for people of average abilities, families, couples and curious individuals. Your Experience With Paris Night Bicycle Tour & River Cruise? Get around the French capital, one of the top tourist destinations in the world, in an efficient and meaningful manner. While cycling your way through Paris, you will many of its iconic landmarks up close. Among other attractions, you will pass by the Eiffel Tower, the Louvre Museum and the Notre Dame Cathedral. Aside from the most famous attractions of the city, you can admire many beautiful structures along the cycling route. While having a break, you will taste some of the most delicious ice creams in the French capital. You will discover two different, yet beautiful faces of Paris - the City of Culture during the day, and the City of Lights during the night. After the bike tour, you will have an opportunity to join a boat tour along the UNESCO-awarded riverbanks of the Seine. What Paris Night Bicycle Tour & River Cruise Includes? Ticket for a cruise of the Seine River. Use of a helmet and bike. On board the boat, you receive complimentary wine or juice. Paris is a very cycle-friendly destination. Since it is flat for the biggest part, you don't need more than an average physical fitness to enjoy this cycling tour. Travelers Reviews about Paris Night Bicycle Tour & River Cruise? Travelers from Viator rate this activity with the overall rate of 5 out of 5, while the reviewers from Get Your Guide assess their experience with 4.7. Their comments imply that Paris is an easy destination for cycling. They also hold the guides performance in high regard. This activity isn't suitable for people with mobility problems. You can present either paper or electronic voucher to take part in the activity. In case you can't make the tour, you can receive a partial or full refund for timely cancellations. You will need to specify at the time of booking if you need a child-sized bike. If requested at the time of booking, the child seat is added to the bicycle. Participants under 18 years of age have to be accompanied by an adult in order to take part in the guided tour. The bike tour is suitable for people of average physical shape. The meeting point is the Dupleix metro station. Duration: The duration of the Loire Valley tour is approximately 12 hours.